This recipe comes from Martha Stewart; it's been in my file of recipes-I'd-like-to-make for a long time so I'm very happy to check it off now. And it all starts with the sweet potato, which gives this soufflé both its flavor and bright orange color. I often roast whole sweet potatoes in a 350 degree oven until softened. I did the same here and used 1-cup, mashed with a fork, for the recipe. And with the essence of all soufflés, the magic comes from folding whipped egg whites into the base. For this base, we make a little roux with a tablespoon of butter and some flour, then adding milk. Once it's thick, we stir in the mashed sweet potatoes, along with maple syrup and a touch of nutmeg for more flavor. Instead of adding 1/3 cup of maple syrup, I used 1/4 cup and relied more on the natural sweetness of the sweet potato. The addition of nutmeg really made me feel like I was baking for Thanksgiving...it conjured up sweet potato and pumpkin pies! Be sure to whip the egg whites until just stiff. I find that over-whipping can be a major issue because once the whites are over-whipped and too dry, it breaks and the soufflé will not rise much at all during baking. After folding the whites into the base, it's ready to be filled into ramekins and baked. Now, one thing that I find a little tricky about making soufflé isn't actually the process but the sizing. That is, I usually don't quite know how many I can make. This recipe called for a 1 1/2 quart soufflé dish but that didn't seem right to me. I ended up using and filling the largest ramekin that I have, a 5-inch round by 3-inch tall container (a little over 2 cup capacity) and placing the remaining soufflé batter into a 3 3/4-inch round by nearly 2-inch tall ramekin. You might want to make one family-style soufflé or smaller, individual, servings. That said, let's remember that while soufflés begin to deflate moments out of the oven, they do stay incredibly delicious. Plus, the large soufflé managed to stay warm for a good half an hour, which worked out well since my husband likes to save his sweet potato for last, like dessert, which in this case it definitely looked like. I hope I'm convincing you to consider whipping up a soufflé or two one day. I'm already mulling over the next variety I should try but in the interim, maybe my family and I need a chocolate one to hold us over until the next experiment? * Wrap one medium/large sweet potato in foil and bake on a baking sheet in a 350 degree oven (I place the sweet potato in the oven while it is preheating) until softened, about 40 minutes to 1 hour. Let cool and then remove the flesh and mash with a fork. In a medium saucepan, melt butter over medium heat. Add flour, and cook, whisking, until golden, about 2 minutes. Gradually add milk, whisking constantly, until thickened, about 1 minute. Remove from the heat. Stir in the mashed sweet potatoes and egg yolks, followed by the maple syrup and nutmeg. Set nearby. In the bowl of a stand mixer fitted with the whisk attachment, whip egg whites with a pinch of salt until it just reaches stiff peaks. Whisk 1/4 of the egg whites into the sweet potato mixture, then gently fold in the remaining whites using a rubber spatula. Pour mixture into the prepared soufflé dishes, filling nearly to the top and smoothing the surface. Place onto a baking sheet and bake until puffed (and just slightly jiggly when moved), about 35-45 minutes. Carefully remove soufflé from the oven, set on a plate, dust with confectioners' sugar, and serve immediately. I was wondering if this should be eating as savory or sweet as well... :) It definitely looks very good and due to the maple syrup I think I would rather like to have it as dessert. I love sweet potatoes too, although I'd be the only one in my family who would love these pretty souffles! You are my hero! This looks magnificent and absolutely perfect. I still haven't made a "real" soufflé but am inspired once again from your beautiful posts! We make a sweet potato soufflé for the holidays but it's not a real one like this. Bravo! Have a happy Halloween with your son - fingers crossed for good weather! YOU are my hero, Tricia. Thanks for all the encouragement and kind words. I have seen other sweet potato souffle recipes so I think I know what you mean and I bet it is just as delicious. I know you will make some amazing souffle when the mood and timing is right for you. Yes...enjoy Halloween with your grandkids. We are expecting good weather here. Monica, your sweet potato souffle is a thing of beauty! You were even able to get it to stay high until you got a few amazing photos. I love sweet potatoes too and hopefully with all of your helpful hints I can make a successful one too! I love root vegetables too especially beet and sweet potato! This is so awesome! I have to make this at least once to taste it.Such an incredible colour and light texture. 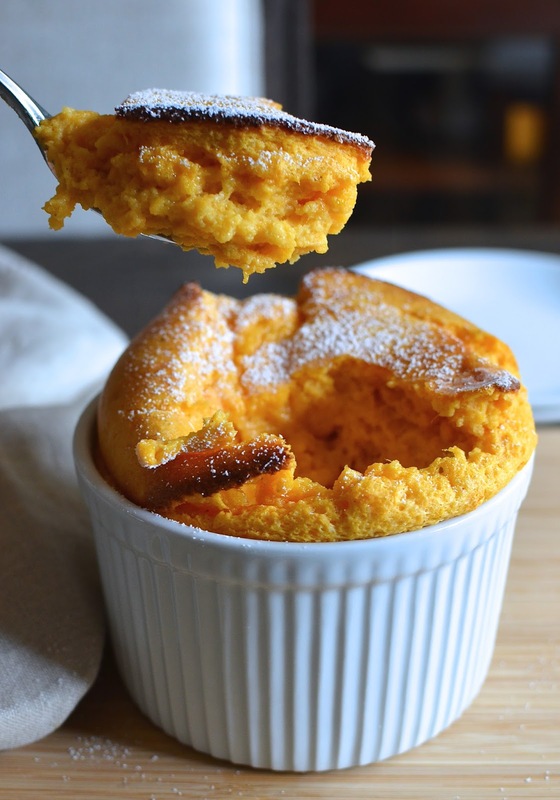 I am such a big sweet potato fan and can't stop drooling over this gorgeous souffle! It looks beyond amazing! I've never tried a savory souffle and love tat this is a little bit of bot! Love the maple syrup too! Thank you so much, Kelly! I'm glad you like it. Hope you and the kiddos enjoy Halloween! Boo! Hi Monica, I'm a huge sweet potato fan too and I bet this is delicious. You make this soufflé sound so easy to make. Pinned for later. Take care! Holy moly I love this! I am also obsessed with sweet potatoes of all kinds but rarely bake with them! Must try this! It's like you made it just for me :) Hope you had a great weekend Monica! haha!! You can safety assume that any/all sweet potato recipes posted here have you in mind, Ashley! ; ) I share your love of it and I always love seeing your creative uses of the sweet potato! What a beauty! I too love sweet potato and this is such a lovely recipe to use this sweet root veggie! Thanks, Angie...we enjoyed it a lot! How pretty is this! What a lovely colour and such a delicate thing to make from sweet potatoes. Me too, Monica! Yesterday I made sweet potato gulabjamun for Diwali and I still have 2 boiled one kept in the fridge. This souffle is going to be mu breakfast tomorrow. Hi Monica, Just made the souffle but they didn't puff up like yours. I used gluten free all purpose flour and 2% milk. That's what I had. What could be wrong? Hi Bal - first was so happy to hear you were going to make it but now bummed it didn't rise for you! Is it possible you over-whipped the whites? I ask because that's the one instance where I hardly get any lift from a souffle...if the whites started to break and be dry, the souffle won't rise much at all. I'm not familiar with using gluten free flour but my gut tells me that using that small amount and the low fat milk should not have made a huge difference. Sorry it didn't work out the way you expected...hopefully, it tasted good. It could be the over whipped whites. Mine was like a cake but was tasty. Will try again. 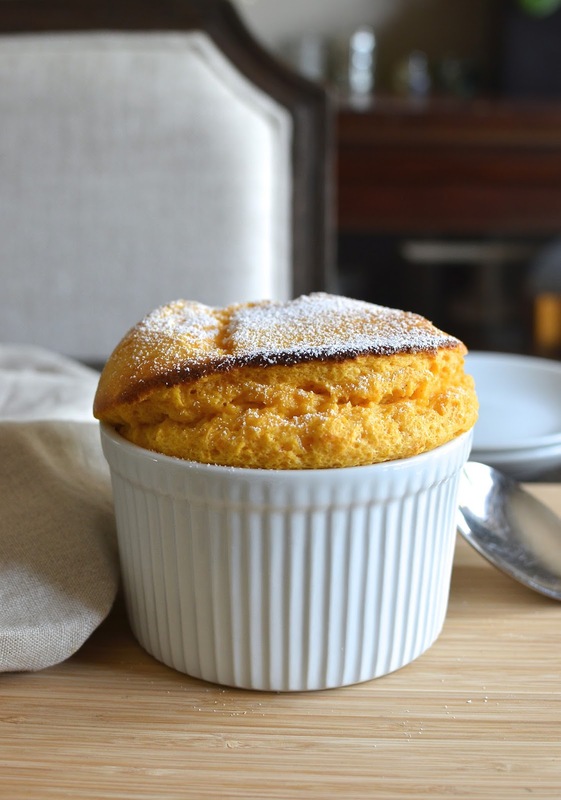 Oh Monica...your sweet potato souffle looks awesome, so light and airy and I love the way it puffed up...I can only imagine the taste of it...yum! Thanks, Juliana - it was pretty awesome and I was happy I finally made it. You enjoy the rest of the week, too. It's like dessert and savory at the same time...very interesting. And honestly, I simply follow tried and true recipes out there. I can't take credit except for bumbling along in the kitchen, trying, like all of us do. : ) Thank you though! We are also sweet potato nuts in our Family! This is perfection! Yay for us sweet potato "nuts"! Thank you, Ashley!